Susan stopped in the Beachcombers Bazaar store for some restocking. That means we have some exciting new Eyegasms colors to offer! If you haven't yet heard me rave about Susan's Eyegasms, here's a quick low down. 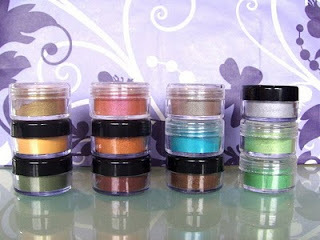 Susan used to use Bare Essentials and MAC mineral pigments for eye shadow. 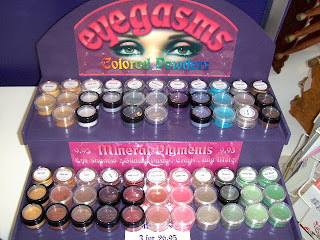 She found that they didn't have a good range of bright fun sparkly colors so she decided to make her own mineral pigment eye shadows using mineral pigments and mica powders. Lucky for all of us! The local belly dancers have been buying from her for years! Susan's mineral pigment colors are positively inspiring! They are completely pure with no fillers to dilute the color (makes them wonderful for making gilding paste for henna tattoos). She also grinds them down to the finest of particles so they go on beautifully. I don't even use make-up brushes. I just use my fingers to apply the color. Any way, back to the new colors at hand! This is not a complete list, but some of the highlights. We now have it! This super cool color may have replaced Smokey Quartz as my favorite mineral pigment color. I wrote a blog article about it when I first discovered Fire Opal last month. It is a yellow orange at first glance (a color I would never select for myself normally), but when you put it on, it's stunning! There's a hint of green sparkle/sheen with the warm yellowy color for the coolest effect. Is it pink, is it coral? I don't know but it's gorgeous! This color will work beautifully for any skin tone. It's sort of a coral with a pink sheen. Perfect for summer. This is bright rich turquoise blue/green though mostly blue. It looks like the chysocolla gemstone. It's very Caribbean-ocean-feeling. OK, so it's not one of her new colors, but it's the PERFECT summer color! It's a neutral taupe kind of color with a turquoise sheen! It's one of the those colors that pairs well with other colors but is perfect when you just want a quick swipe of color and don't want to put any work into it. Kind of like Smokey Quartz. Yes, I know this is not a new color either, but again PERFECT for summer! It's a glorious light green color almost minty, expect it has a slight golden shimmer. The golden shimmer makes all the difference. This is the combo I'm wearing today. The White Gold can be worn on the inside of the eyes with nearly any other color. It really opens up the eyes and adds a new dimension to your make-up. Stop in the Orlando store and let's see what combos you come up with!